Most of our last day was spent as special guests of the Stellenbosch Flying Club, where we were given flights around the Table Mountain by local pilots. The Chairman, Nicholas Horwood, welcomed us warmly and each Earthrounder was introduced by Claude Meunier. 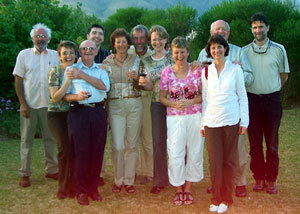 After a well deserved rest, we had a wounderful and colorful South African dinner at a very special venue. The evening ended up with a warm birthday party for Dorise. And so ended a very successful meeting. Plans are already being drawn for the next meeting in Brazil. 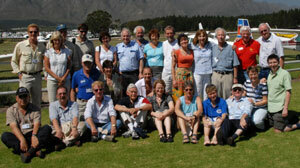 Group photo taken at the Stellenbosch Flying Club. Another very full day. It started with our last 'round table' where Collin Boddil told us of the difficulties of flying in Antarctica. After, we went by bus to Cape Town and had a ride on the cable car to the top of Table Mountain. Only from this point of view could we have an idea of the size of the city. This was followed by a visit to Frank's Heaven, a crèche and kindergarten, he and Dorise created. It was great to see all those happy children having a good start in life. Wine tasting followed at a neighbouring vineyard. Then, we had the presentation diner in one of the best restaurant in Cape Town. The Earthrounders flag was passed by Dorise to Gerard and Margi Moss, as the next meeting will take place sometimes, somewhere, in Brazil. Flowers and a crystal plate were presented to Dorise and to her daughters. And finally, Attendance Certificates were presented to all. A very full and rewarding day. Today, Thursday, we travelled to the very tip of South Africa, the Cape of Good Hope, where the Atlantic Ocean joins the Indian Ocean. We drove through vineyards, national parks and barren, wind beaten, land. 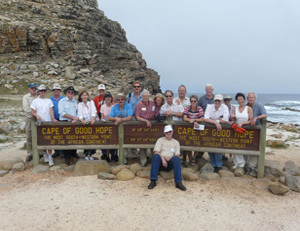 We had the usual photo session in front of the Cape of Good Hope sign. An excellent day which started with a 'round table', where everybody introduced themselves with a short CV, followed by many subjects of interest to all Earthrounders, under the chairmanship of Gerard Moss, who kept the discussions running. It appeared that a 'majority' favoured Brazil as our next destination...Watch this space! That was followed by a fascinating presentation by Rick D'Agrela of his RTW in a weight-shifting ultra light aircraft. He lost his flying companion, Alan Honeycombe, who crashed in China. A very difficult flight compared with those done in the comfort of a pressurised twin. A great and delicious lunch took most of the afternoon. Another 'round table' where technical details were discussed, such as maintenance abroad and insurance, and, for those who still do not know how to lean 'on the lean side of a peak', well, after this forum of ideas and advices from the experts, they will never know! The evening was spent at Dorice's mansion. A very full day! Registration day: Earthrounders arriving from all parts of the world, old acquaintances and new comers. We had a beautiful evening meal at the Estate, a few short speeches, lots of photos, good food and great company. 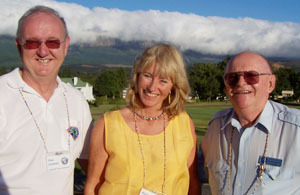 Earthrounders and Earhrounders-to-be are arriving in Cape Town. This morning, Dean Stahr and Claude Meunier had a very pleasant flight around the Cape. This afternoon, participants gathered at Dorice's mansion for a few drinks, followed by an evening meal of local specialities. From left to right: Claude Raymond, Claudia Gore, Claude Meunier, Robin Gore, Angela Pedersen, Flemming Pedersen (without plaster! ), Bianca Hettlich, Dorise Hettlich, Katarina Lenarcic, Dean Stahr, Matevz Lenarcic. Missing on the photo: Bill Charney, Jay Shower and Ann Pooch, who arrived later.